Looking to book Kris Allen for a corporate event, private party, fundraiser or public event worldwide? BookingEntertainment.com makes it easy and trouble free to check availability and pricing for booking Kris Allen or any other act in the business with absolutely no obligations. Booking Entertainment is the leading entertainment booking agency specializing in booking Kris Allen. We will be happy to help you get Kris Allen's booking fee, or the price and availability for any other band, comedian or celebrity you may want for your corporate event, birthday party, wedding, fundraiser or public show. At Booking Entertainment, we put our 23 years in business behind you to help you get the best price for any entertainer, comedian or celebrity for your event. In addition, our team of seasoned industry professionals can handle every aspect of the entertainment portion of your event to make sure the entertainment runs flawlessly. If you are wondering how to book Kris Allen for your event, you can trust our Kris Allen agent to handle it for you. Find out why Fortune 500 companies, high net worth individuals and fundraising organizations come back to Booking Entertainment year after year for their entertainment buying needs. We can literally book any act for you anywhere in the world. When he was seven years old, Kris listened to a cassette of Michael Jackson’s “Dangerous” and his life changed forever. “I’d be alone in my room and I would sing and dance and try different hats on. I’d stand in front of the mirror and try to moonwalk, but it just didn’t work. One night my dad walked in and caught me. I stopped in my tracks but he thought it was hilarious.” Despite that embarrassing moment, Kris’ parents, Neil and Kimberly, were always supportive of their son’s interest in music and never once suggested that he consider any other career than the one he was most interested in. Neil was a musician himself – he played guitar and sang lead vocals for a rock band called Maxxzoid. He also had a record collection and Kris enjoyed listening to his dad’s albums, especially artists like Garth Brooks, Journey, Queen and Foreigner. When Kris was born on June 21, 1985, his dad gave up his music career and went to work at a car dealership to support his family. Kris’ talent was apparent as early as the fourth grade, when he learned to play the viola and joined the school orchestra. “I tried to be cool and play baseball. Playing viola is not the coolest thing in the world. I kept going but stopped right before college.” By that time, Kris had already picked up another instrument. “At 13, I was a chubby little kid trying to play the guitar. My brother Daniel would go swimming all summer so I was home alone and no one knew what I was doing all day.” Kris never took a lesson, so his guitar-playing was entirely self-taught. By the time he enrolled in college, he knew he wanted to play music professionally. “When I was a freshman I realized I needed to start writing songs.” During his sophomore year, he played his first gig at a local bar. “It was in downtown Conway and the place was filled because it was the bar’s opening night. It was also their closing night. I don’t think it was our fault, because everyone said we played well. That night is when I got the encouragement to keep going.” Kris played gigs in nearby Little Rock and Fayetteville and recorded a CD when he left college in the middle of his junior year. He continued to play gigs at night while working as a salesperson at Hibbert Sporting Goods during the day. Though not an avid television viewer – Kris and his wife Katy don’t own a TV – Kris did see the Season 6 episodes of “American Idol” when his friend Sean Michel won praise from the judges during his audition. “It was great to see someone from Arkansas make it to Hollywood.” Living with his parents during season 7, Kris became hooked on “Idol.” In July 2008, Kris’ brother Daniel decided to audition in Louisville, Kentucky, and asked Kris and a friend to go with him. “We arrived and there were 12,000 people standing there and we were the last ones to sign up. It was intimidating,” Kris says. Kris and Daniel survived the first round of judging but only Kris made it into see Simon, Paula, Randy and Kara. Randy was the first to say yes, followed by Simon, then Paula and Kara. Kris and Katy were married that same month and after the honeymoon flew to Hollywood. “I was just hoping to get a little TV time so someone would recognize me and I could start a music career,” says Kris. Kris made it from Hollywood week to the top 36 to the top 12 and survived elimination week after week, heading into the finale with Adam Lambert. When Ryan Seacrest read the The Band Perry of the winner, after a long pause he said. “Kris Allen.” Kris’ path to victory included memorable performances of Bill Withers’ “Ain’t No Sunshine,” Michael Jackson’s “Man in the Mirror” and Kanye West’s “Heartless.” Kris was praised by the judges for his original arrangements of such well-known songs. “What I do is completely forget about the original version and ask myself how I can play the song when it comes to phrasing, chord structure and emotion. I hear what it’s going to sound like in my head and run with it. Hopefully it’s a way that no one has ever thought of doing it before.” Since the finale, Kris has had multiple songs appear on the Billboard charts. “That was crazy!” he exclaims. “Four months before that we were all unknown. That first moment I knew I had five songs on the Billboard chart was very cool.” At the same time, his finale song “No Boundaries” was No. 1 on the iTunes chart. Kris found out when a friend sent him a text message. “I had no idea. That was crazy, too!” It’s been an incredible journey for the 24-year-old who came very close to giving up on having a music career. “I was going to return to college and get a decent job so my wife and I could have a comfortable life together, which would have been fine. But things worked out a different way, and I’m really happy!” Kris is currently on tour promoting his self-titled debut album released on 19 Recordings/Jive Records. His first single “Live Like We’re Dying” has sold over 1.5 million to date. His second single “The Truth” ft. Pat Monahan of Train, is currently climbing the charts as it hits the airwaves. For more information on booking Kris Allen, please contact Booking Entertainment. One of our top booking agents will be happy to work on your behalf to get you the best possible price to book any big name entertainer for your upcoming public, private or corporate event worldwide. The agents at Booking Entertainment have helped clients book famous entertainers like Kris Allen for private parties, corporate events and public shows around the world for over 23 years. Our agents will be happy to assist you with any of your famous entertainment buying needs. All you need to do is fill out an entertainment request form or call our office at (212) 645-0555, and one of our agents will help you get pricing information and available dates for Kris Allen or any other A-list entertainer for your next event. How to book Kris Allen for a corporate event? 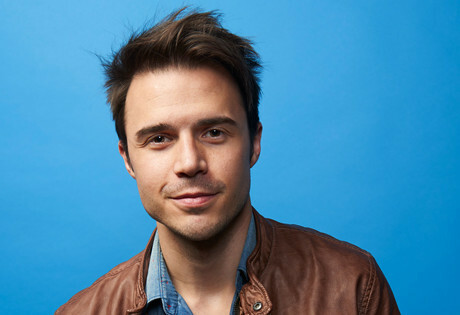 Booking Kris Allen for corporate events is a great way to thank your employees and clients, and in addition, hiring Kris Allen for a corporate event is a fantastic way to promote your company's image to your industry. Booking Entertainment can book Kris Allen for corporate events worldwide, providing you with the fee to book Kris Allen and their availability on your specific date. We have helped our clients book Kris Allen and thousands of other acts for almost 25 years. Whether you are looking at hiring Kris Allen for a corporate event, product launch, trade show, holiday party or an employee appreciation event, your assigned Booking Entertainment agent will be happy to get you the best price for booking Kris Allen and help make sure that every aspect of the entertainment portion of your corporate event is executed flawlessly. How much does it cost to book Kris Allen for a corporate event and what do the fees for booking Kris Allen include? If you are looking to hire Kris Allen for a corporate event and are looking for Kris Allen’s booking fee for corporate events, Booking Entertainment will be happy to get you pricing to book Kris Allen for your date for free. The cost of hiring Kris Allen for your corporate event can include just the price of booking Kris Allen for a corporate event, or we can give you an estimate for booking Kris Allen that includes absolutely everything that goes into hiring Kris Allen including all fees, flights, hotel, ground, production, green room requirements and our veteran production team onsite to make sure everything runs smoothly from load in to load out. How Much Does It Cost To Hire Kris Allen? Looking for Kris Allen booking cost, fee or pricing? When you are booking an act like Kris Allen, many factors determine the final price, including the artist's touring schedule and other shows they may have in your area. Fill out an entertainment request form or call our offices at (212) 645-0555 and one of our booking agents will get you a pricing fee and availability for your date and assist you in booking Kris Allen or a different well-known act for your next event. How Do I Hire Kris Allen For A Private Party? Wondering how much does it cost to book Kris Allen for a private concert or will Kris Allen play a private party? Whether you are looking to book Kris Allen for a wedding, private party or anniversary party, our Kris Allen booking agent who specializes in booking Kris Allen will be happy to help you to book Kris Allen and take care of everything necessary to make sure the show is executed flawlessly. Fill out an entertainment request form or call our office at (212) 645-0555 and one of our Kris Allen booking agents will assist you in hiring Kris Allen for a private event anywhere in the world. How do I hire Kris Allen for a college concert from booking agencies that book concerts for colleges and universities? Booking talent for college and university events is something Booking Entertainment has been helping college talent buyers do for almost 25 years. Whether you are looking to book Kris Allen for a sorority party / fraternity party or a college concert event sponsored by the college entertainment committee, college talent buying is something we specialize in at Booking Entertainment. Simply fill out our form, email us or call the office and one of our college booking agents will be happy to help you make sure that every aspect of booking Kris Allen or anyone else for you college event is taken care of to ensure your college or university concert runs smoothly and cost effectively. How much does is it cost to book Kris Allen for a college or university concert and are fees for booking college concerts less expensive? When college entertainment buyers book famous entertainers such as Kris Allen to play for college concerts, sorority parties or fraternity parties at colleges and universities, we know the acts tend to charge a lower fee than they would cost for a traditional public or private concert. Of course, how expensive it is to book college entertainment depending on how big of an act they are, but colleges and universities tend to get a better fee for booking big name entertainment for college and university events. One of our college entertainment booking agents will work closely with you to make sure you get the best possible price for your college’s concert. Buyers who don't have a lot of experience booking famous acts often find the process frustrating when they try to do it on their own. Our Kris Allen agent that specializes in booking Kris Allen can use our reputation and relationships to help you navigate the entertainment buying process and get your offer for booking Kris Allen seriously considered. The artist’s managers want to know that everything will be handled properly, and Booking Entertainment’s stellar 23-year reputation and our attention to detail provide them with the peace of mind that the show will be flawlessly executed from beginning to end. How Do I Book Kris Allen For A Fundraiser or Gala? Wondering how much does it cost to book Kris Allen for a fundraiser or will Kris Allen play a gala? Your assigned Kris Allen agent will be happy to help you to book Kris Allen and we can even take care of everything necessary to make sure booking Kris Allen is easy and trouble free. Fill out our entertainment request form or call our office at (212) 645-0555 and one of our booking agents for Kris Allen will assist you to book Kris Allen or any other entertainer or celebrity for your next fundraiser or gala anywhere around the world. How Do I Book Kris Allen To Perform At My Wedding? You might ask yourself, “How do I hire Kris Allen for a wedding?" We have helped hundreds of clients book acts like Kris Allen for weddings and wedding ceremonies worldwide. Your assigned Booking Entertainment agent will not only be happy to assist you in hiring Kris Allen to perform at your wedding, we will be onsite to make sure booking Kris Allen for your wedding is executed flawlessly. Can I book Kris Allen for a wedding and how much does it cost to book Kris Allen to sing at a wedding? If you are serious about booking Kris Allen for a wedding, Booking Entertainment will gladly get you the Kris Allen booking fee and availability for booking Kris Allen for your wedding date. The price for booking Kris Allen will include all of the fees and additional expenses necessary to hire Kris Allen for a wedding including all production costs, flights, hotels, ground and green room requirements. If I hire Kris Allen to perform at my wedding, how do I integrate booking Kris Allen into my wedding? Hiring celebrity entertainment for a wedding is a great way to surprise the guests or even the bride or groom. When we book big name acts like Kris Allen for weddings, we work closely with the wedding planner beforehand to make sure everything involved with the entertainment integrates seamlessly with the flow of the wedding . Our staff of veteran producers will then be onsite at the wedding to make sure when you book Kris Allen for your wedding, everything runs smoothy from load in to load out. How do I contact Kris Allen’s agent or Kris Allen’s manager? Even if you have Kris Allen contact information, Kris Allen’s management contact info like Kris Allen’s manger's email or even Kris Allen’s manager's phone number, you still need a company like Booking Entertainment to help coordinate everything that is necessary to book Kris Allen to perform for your event. Agents and managers contact us all the time to help people that find the agency contact info or management contact info and contact the agents and mangers directly. Managers and agents trust our agency to handle everything to the industry standard as we have for almost 25 years. How Do I Book A VIP Experience With Kris Allen At A Event Or Concert? With Booking Entertainment, booking premium seats and backstage meet & greets with Kris Allen is easy and accessible to anyone around the world. Fill out an form or call our office at (212) 645-0555 and one of our agents will assist you to get pricing and availability to have Kris Allen VIP experience at a concert or event. Booking Entertainment works to get the best possible Kris Allen booking fee and Kris Allen price for our clients while also providing the celebrity or famous entertainer with the level of professionalism and industry norms that they expect from an event run by a professional booking agency and production management. Booking Entertainment uses our agency / management relationships and over 23 years of production experience to help buyers of headline / top name entertainers and does not claim or represent itself as the exclusive Kris Allen agent, manager or management company for any of the artists on our site. Booking Entertainment does not claim or represent itself as the exclusive booking agency, business manager, publicist, speakers bureau or management for Kris Allen or any artists or celebrities on this website.